I am fortunate to have had a wealth of experiences and memories on the track and in the ring. I look forward to the opportunity to share those in a way that can be meaningful to help others grow. "I love being the underdog and performing beyond my own expectations and those of my fans and competitors." Born and raised by a single-father on California's central coast, Stephanie attended Arroyo Grande High School where she was a track and basketball standout. In the ring, she earned multiple California state titles (2 shot put and 1 discus), including a winning discus throw which stood as one of the 10 best American high school throws ever (181.25'). On scholarship at Cal Poly San Luis Obispo, Stephanie endured a torn ACL that ended her basketball career during her sophomore year. It was at that point that she dedicated herself to track and academics. Stephanie earned a degree in Industrial Engineering while racking up 6 All-American titles between discus and shot put. Following her stellar collegiate career, Stephanie competed in three Olympic Games (2004, 2008, and 2012). 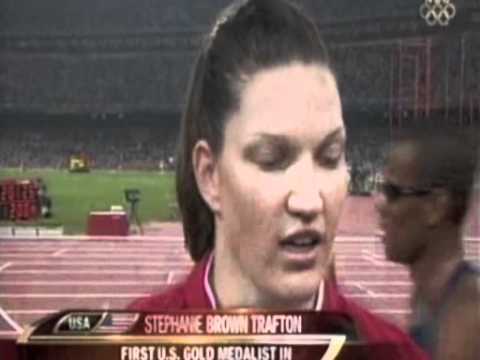 At the 2008 Games in Beijing, she became the first American woman to win an Olympic Gold Medal since 1932. All this, and Stephanie still is not done. She says, "I plan on competing in Masters competitions in the hammer throw. I just started learning how to throw." "I love to dance and enjoy Zumba classes for keeping fit. I use my discus shoes for Zumba class." Stephanie's life outside of the ring is certainly full. In addition to her continuing athletic pursuits, she is a mother, and volunteers time in nursery at Family Life Christian Church. Faith being an important part of her life, Stephanie hosts bible studies at her house. "After sport I aspire to be a fan of my family's hobbies and support my kids in their school, sports, and activities." Stephanie's family has been hugely supportive of her athletic career, through the traveling and time away training, for which she is certainly thankful, and is eager to be equally supportive. As for what's next, she says, "During my free time I would like to continue to work in Project Management for a local government agency or private company."